Valdaiclub.com interview with Andrei Klimov, first deputy head of the State Duma committee on foreign affairs. What is your reaction to the resolution of the European Parliament describing the presidential election in Russia as unfair? There is not much to say. I think the European Parliament often passes resolutions that are not based on common sense or are not within its authority. Suffice it to say that the European Parliament has not been charged with monitoring parliamentary or presidential elections outside the European Union, in particular, in Russia. Nobody has given it such powers. Yes, Russia has certain obligations to such international organizations as the OSCE and the Council of Europe. Their observers come to Russia and write reports that we review. But in this particular case, the resolution reflects the opinion of a group of EU citizens that have adopted it on their own accord. I have strong doubts about its objectivity. Russia and the European Parliament have only one legitimate venue for such debates – the Parliamentary Cooperation Committee, where the equality of the sides is an overriding principle. Last fall we agreed to discuss in the first half of this April the state of affairs in Russia after the parliamentary and presidential elections. An official joint group is scheduled to hold a meeting on this subject in the State Duma in Moscow on April 4. I would probably understand the motives of the European Parliament if its officials had conducted their hearings after the forthcoming meeting, but they chose not to wait for it. Initially the language in the resolution was rather mild, but a number of subsequent amendments made the final text tougher. Some Euro deputies even insisted that the Russian government should must make political reforms or face expulsion from the Council of Europe and the OSCE… What difficulties in relations between Russia and the EU could cause such a reaction? Again, I don’t want to comment on the text, as it has no legal basis. They suggested expelling Russia from the Council of Europe? But what does the European Parliament have to do with this? This is not within its authorities. 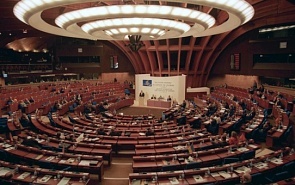 The Council of Europe has its own Parliamentary Assembly that consists of representatives of national parliaments rather than deputies of the European Parliament. Decision-making in the Council of Europe is the prerogative of its Committee of Ministers, which consists of national ministers. The European Commission has nothing to do with it. How do you explain the negative attitude to Russia that prevails in European political institutions? People who have made their careers on Russophobia have nothing else to do. This is why they concern themselves with writing texts like the one you have cited. People who are really interested in constructive dialogue with Russia do not waste their time discussing senseless texts. Could you cite examples of flaws in EU elections? There are many such examples. Take Belgium, where Brussels, the EU capital, is located. You can vote there under a power of attorney. We were criticized by many for absentee ballots. But people who come to a polling station with these ballots must carry passports with their full names. Each of them is entitled to just one ballot and can only vote once. A person who has absentee ballot issued in a different name is not allowed to vote. But in Belgium you can come and vote for yourself and for someone else under a power of attorney. I have personally witnessed people voting in Brussels without any documents at all. They simply state their names – that’s all. Imagine something like this happening in Moscow. An Eastern-looking man comes to a polling station with 20 women in hijabs and says: “They are voters. They don’t have any papers but I know them personally.” Then he accompanies each of them to a voting booth, one after another. I have seen such things in Brussels. What is this all about? Regrettably, such examples are numerous. This is why I’d recommend that deputies of the European Parliament should make sure everything is in order in their own kingdom. In Russia more than a hundred million people are eligible to vote. Nobody has prohibited anyone from voting. What if they all turned out and voted? What would the European Parliament say? They would probably have nothing left to do. But some people in this country do not want to vote for whatever reason. And in Latvia, for one, people want to vote but don’t have the right to. They were born and live there but when they come to a polling station, they are told to leave because they are not citizens. And this is happening in the EU. This is why they don’t have a moral right to reprimand us like this. The final text of the resolution urged the Russian opposition to unite and fight for political reform in the country. What are the chances that different elements of the opposition in Russia will unite to act as a single constructive political player? It is not up to the European Parliament to make such appeals. This issue pertains solely to our civil society and our government. Such appeals amount to interference in the internal affairs of a sovereign member-country of the UN. We don’t, say, urge the opposition in France to unite and overthrow Sarkozy whose methods are not approved by everyone, far from it… We don’t make such appeals to Germany or Italy. We don’t play such games, and we are right not to. Regarding the Russian opposition, it has had such limited success for one simple reason – the so-called non-systemic opposition is used to resolving its issues by staging rallies within the Garden Ring in Moscow, not somewhere in the provinces. Also, they constantly complain in London, Brussels or Washington. This is why they have such a low approval rating in Russia. According to polls, 85% of our people have not witnessed any election fraud. If we combine all opposition votes, if all opposition parties had registered and taken part in the voting, they would not have gained more than 10%-15% anyway. And their participation would not have affected turnout, either. There were periods in Russian history when more than 40 parties were registered and ran candidates in elections, but turnout was about the same as now. But this time the overwhelming majority of people – practically nine tenths – voted for the parties that are already in parliament. This is how matters stand. For all that, we have from 15 to 30 people with Napoleonic ambitions. They see themselves as the leaders of parties and won’t settle for less. But megalomania has never facilitated unity. If they could overcome their megalomania, they would probably achieve something, but this is unlikely because they are already fully formed adults. Maybe if new players emerge and unite people around their new, constructive ideas, they could form a genuine opposition party that could come to power in the future. However, statements by some people from the European Parliament have nothing to do with this – no connection at all. Nonetheless, we will simplify party registration rules, and last week the State Duma passed a law on this in the third reading. Incidentally, the authors of the resolution urged President Dmitry Medvedev to move from words to deeds in political reforms. Once again, this has nothing to do with the resolution. We have been discussing changes in these rules for the last two years. Draft documents were ready in the summer but at that time a new electoral cycle was in progress. This is a universal rule, and it is valid in Russia, too. We could not change a rule regarding political competition until the completion of the election cycle that started in late August and only ended this March. This explains why the relevant bills only appeared in March. You can always look for a black cat in a dark room, as we say, but you won’t find it for a simple reason – it’s just not there. We are working to improve our political system based on our own specific characteristics, and not at all because of something written thousands of miles away.